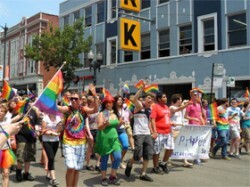 Parade goers enjoyed a day of sun during Chicago’s 43rd annual Pride Parade on Sunday June 24th. Rainbow striped flags waived in the air as supporters witnessed an array of floats, music, performers and visits from city officials that included Mayor Rahm Emanuel and Gov. Pat Quinn. The colorful parade took off on Broadway and Montrose (Uptown) and broke record this year as approximately 850,000 people came out to lend their support to the LGBT community.